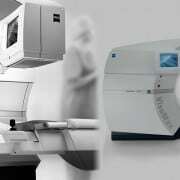 There are many different types of laser eye surgery procedures. At FOCUS Laser Eye Centre, we screen each of our patients thoroughly to ensure a personalised treatment solution. 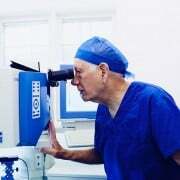 Browse through our list of laser eye procedures and other treatments. The 2018 Glaucoma Awareness Week campaign aims to find 150,000 Aussies who are unaware they have glaucoma. ReLEx & SMILE Laser Eye Surgery is the latest technology in laser vision correction and used to treat people who are short sighted. Lasik Surgery is used to treat people who are short sighted, long sighted or who have corneal astigmatism. PRK Surgery is used to treat people who are short sighted, long sighted and those with astigmatism. Suitability for PRK is dependent upon the corneal thickness and shape. 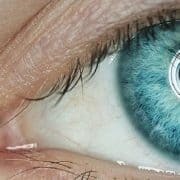 Implantable contact lenses (otherwise known as phakic IOLs) are used to correct very high refractive errors where laser treatment may be unsuitable. 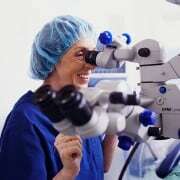 Cataract Surgery is a microsurgical procedure used to remove cataract from the eye. In some patients after cataract surgery, the lens capsule becomes cloudy. This causes the vision to become cloudy or hazy. In these instances YAG Laser Capsulotomy is recommended. A laser beam is used to create an opening in the cloudy capsule and this allows light to pass through easily. The cornea is responsible for the accurate bending of light rays onto the retina which gives us a clear image. Corneas that are cloudy due to disease, trauma, or genetic distortion (keratoconus) may benefit with grafting. This relatively new treatment is offered to patients with mild forms of Keratoconus. Keratoconus is a condition in which there are weakened bonds in the collagen fibres of the cornea. A pterygium is a triangular shaped growth that covers the white part of the eye. Pterygium surgery treats this eye condition. Every year many men and women chose to have corrective eyelid surgery or Blepharoplasty. Droopy lids cannot only be uncosmetic but also interfere with vision. Glaucoma is an eye disease which can damage the optic nerve. It typically occurs in people over the age of 60 and those with a family history. LPI Glaucoma treatment is performed in cases of “angle closure”. Glaucoma is an eye disease which can damage the optic nerve. It typically occurs in people over the age of 60 and those with a family history. SLT Glaucoma treatment is an option for lowering the pressure in the eye to treat open angle glaucoma. Trabeculectomy is a surgical procedure used in the treatment of Glaucoma. Intravitreal injections are used to treat macular degeneration, diabetic retinopathy, retinal vascular diseases and ocular inflammation. Our centre is perfectly equipped to perform minor eye procedures and injections. Small “lumps and bumps” appearing on the eyelids can be removed quickly and safely under local anaesthetic. Copyright - Focus Laser Eye Centre - site design red k.